Junior League of Norfolk Virginia Beach, Inc. has been positively impacting the local community for over 90 years. We provide trained volunteers for local projects as well as financial support for organizations in need. We annually focus our support on a diverse group of programs to address the needs of our community in an effort to effectively impact as many organizations as possible. The variety of programs also helps engage our League members by providing a wide range of volunteer opportunities. We are proud to announce that we will continue and expand upon this initiative, initially known as Project Makeover Hampton Roads, in 2019-2020 with the new name, Elevate to Educate! Members of the JLNVB support Saturday drop-offs for mothers donating valuable breast milk in support of the King’s Daughters Milk Bank at CHKD. Due to the popularity and increasing demand by donors, we have expanded our outreach to a second collection site in Virginia Beach. 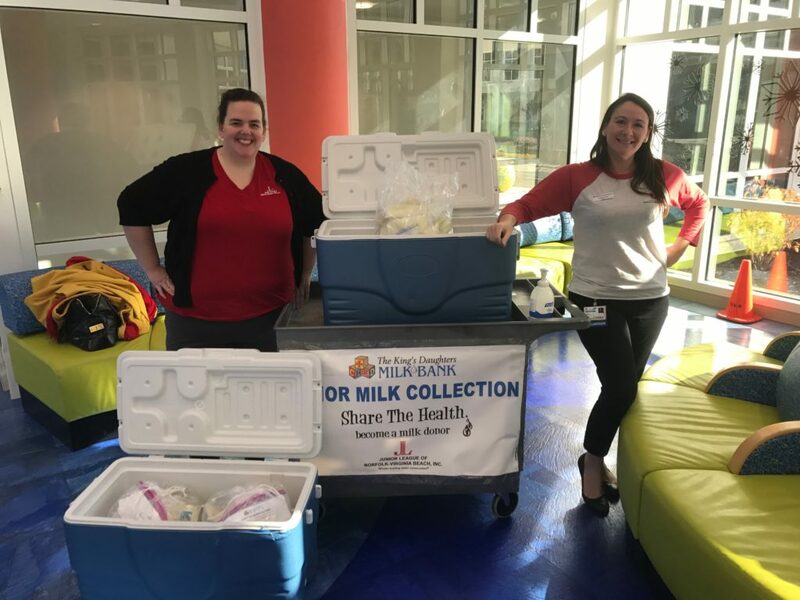 Our members are now collecting milk donations every weekend at either the Main Children’s Hospital in Norfolk or at General Booth Pediatrics in Virginia Beach. Due to our increased participation, we have trained more than 20 new volunteers this fall to support our Milk Bank initiative. To date, we have collected 18,896 ounces! Twice a month JLNVB partners with the Union Misssion’s family shelter to develop a reading program for children under 12. JLNVB members read aloud with children, help them create activity sheets and play literacy focused games with the children. Every child who attends also receives a book to keep! This summer we started incorporating our focus on Women’s Health by donating NICU care packages to provide support for the new parents during this difficult time. The care packages are hand-delivered to the NICU unit by our members and they include toiletries, a notebook with pen, and a receiving blanket. Each care package also includes a children’s book for the parents to read to their child.